When it's time to come indoors, gather in the living room for a movie on our large new 46" HDTV and Blue Ray/DVD Player. The sofas in here are very comfortable, the floor is cool and smooth! The dining room is soaked in sunshine, the idea setting for a jigsaw puzzle that the whole gang works on or a spirited game of the Settlers of Catan. 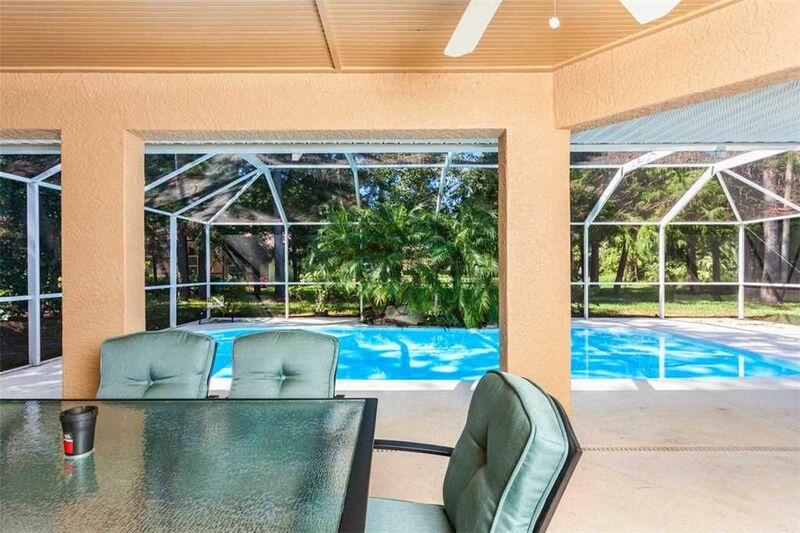 Let's face it -- you're going to carry most of your meals out onto the lanai to enjoy, so feel free to re-purpose the dining room into a family fun center! The kitchen adjoins the dining room, and we think you're going to love using this room. Bright and spacious with newer appliances, cabinets full of cookware, dishes, and utensils. This little table also makes a great place to set up your laptop. You have free WiFi at Wood Haven, so feel free to bring all your electronics! Some things you won't have to bring to Wood Haven are linens, towels, or numerous changes of clothes. We provide all the sheets, blankets, pillows, and towel sets you need for every bed and bath in the house, and we make our new washer and dryer available to you to keep your vacation togs clean. You'll be amazed at how many towels you go through with all that pool time -- and at how easy it is to keep everything fresh and dry with our laundry room! You'll look forward to retiring to your bedroom each evening at Wood Haven. Our house sleeps 7 people very comfortably, and no space is more palatial than the master suite. Here you'll find a master with a queen-sized bed, walk-in closet, his-and-her lamps, and a 42-inch flat-screen TV for late-night viewing. Slip through the sliding-glass doors and you're at poolside, just in case you enjoy a midnight swim or an early-morning water aerobics session. The en-suite bathroom is spacious as well, with a separate dressing area and a walk-in shower. The second bedroom contains a queen bed and a 32" HDTV, while the enclosed sunroom can function as a third bedroom has a bunk bed with a single on the top and a double on the bottom and an extra single bed on the side (sleeps up to 4). This is a great space if you're traveling with a group of children. There are numerous separate beds so no one has to share! At Wood Haven, you're just 5 miles from the beach, and right in the heart of lovely Palm Coast. World-class golf, dining, and shopping are at your fingertips. Come stay in our relaxing house. I would like to thank the owner for the use of the property as well as his attractions we all had a great time and we will be back! Tuvimos una estancia muy divertida en esta casa, muy limpia e igual que en las fotografias, cerca de todas las tiendas para cualquier cosa que pudieramos necesitar, muy comoda, la mejor parte la alberca, nos encanto!! This was my first time using HomeAway for a vacation. I was expecting the photographs to show the place in a better light than reality. In fact, I was pleasantly surprised! What a great place! The master bedroom and attached bath are fabulous! If I could change one thing, I would have preferred a heated pool. Although the kids did not seem to mind, the water was COLD!